I gotta say fantastic work so far on all aspects, I really enjoyed playing this little demo and it has me craving to see much more. Keep it up dude. Anyways, we both had a Tumbli with gather holding an oran berry. (Not sure if it needs that) but if it had died and we opened the party screen with it KOed, it would cause a crash. It happened to me many times, it was the only pokemon we both had and we both experienced the same crash, so I'm fairly certain that it was causing it. I'm doing my first playthough on your fangame and I really like what i'm seeing and I hope it will keep getting better. New update is finally out. Will be fixed in next update so the steps with the pokedex and outfits aren't required. Just fixed this bug as well and it will be in the next version. Welp, I think I have myself stuck. It's quite far into the demo, but let's go over some things I found up until that point. First off, let's go over the elephant in the room. All of your bridges are broken. It's not just this one. They all appear on top of the player, even the water ones. I freeze every time I walk on this tile. I can use the menu, but that's about all I can do. I didn't bother saving on this so I got out, but it's an issue. This move doesn't work. When you use it, this message pops up. and then skips the turn. My biggest issue now is I beat the admin next to the frozen mon, went to the sailor and went back to the city, but now he won't let me go back. He has the text saying yeah let's go, but then nothing happens. The difficulty is nuts, btw. Having it on set really doesn't help. I have the dowsing machine, but do we get the exp share anytime soon? Cause I don't want to grind again like I had to do for the admin. Thanks for the reports. All of these are fixed in the next version now, except for the bridge stuff, which I can't reproduce. The EXP Share is available as soon as you reach Patagon City, if you know where to find it (several NPCs hint at its location). The sailor is a bug, but you can get back to Sandy Town by going back through Sahara City and going west. And going back to Sandy Town in general isn't required to make progress after defeating the blue admin, since defeating him unblocks the North gate in Sahara City. RIP my Pansurge that makes me sad. 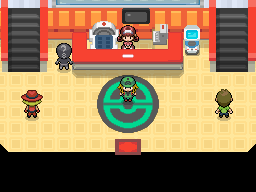 In the starter lab you have an npc that says nothing for some reason .. The game is enjoyable but I can't understand why it lags so badly.. is it because i am running a 32 bit game on a 64 bit OS or something? my pc is really good..
RIP my Pansage that makes me sad. The lag is because of map connections I think. For some reason I found that the game lags far more after I have it compressed than when I'm working on it uncompressed and in debug mode. I'm considering just scrapping every map connection and just using ORAS style map transfers to reduce lag. The event is probably because of a compatibility bug with the self switch between versions. I'll fix it. Why was pansurge changed? and why did you remove other pans from the wild? v1.3.1 is out with some fixes. 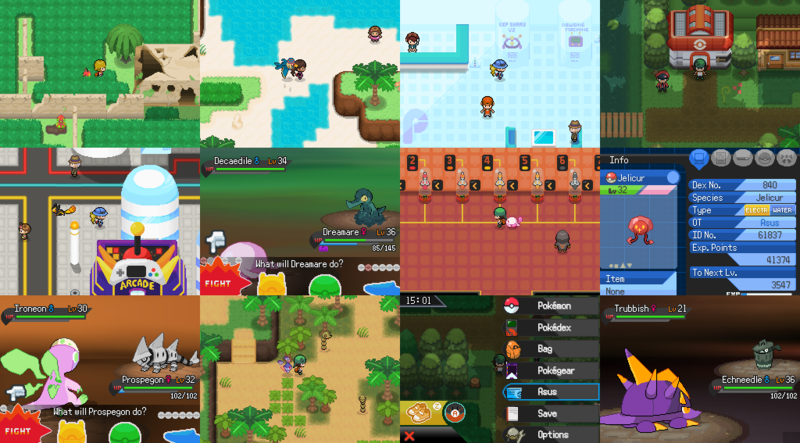 Since the wiki is out of date I will also post the pokemon.txt and encounters.txt PBS files if anyone wants them as a guide or if they want to help update the wiki. I didn't care for the idea anymore since I'm now focusing on original designs. The Kangaskhan line, Druddigon line, and Solrock/Lunatone lines are also gone now unless I can think of good concepts for them later. Spoiler: More stuff, post Sandy Town. There isn't a whole lot I can say. Quite a lot of the jungle is just flat out obnoxious, to be frank. The Ammoflage poisoning all the time is just annoying unless you have a poison type in the party(since it doesn't get hit). I have to admit I never did manage to find the 4th coconut in the dry zone, but I saw it past the statue so I'll be back to look through that eventually (not really a bug just reminding myself for later). I think a lot of your Pokémon are way overpowered. Like Ninjask is way too fast and hard hitting. When a lv33 Pokémon can one shot stuff that's a little scary. Ariados is surprisingly bulky and I think that's the most balanced one so far. Priorities on the walls in the ruins aren't on. Bottoms of the trees are missing here on cycling road. This gondolog randomly teleports sometimes. Not all the time, but it does sometimes. Medunaga doesn't have a sprite on the party. Thanks for the bug reports. New version again. Fixed the Nimbian NPC, a bunch of tile errors, added a few more sprites, and fixed some other bugs I found myself. If there are any sprites still missing it's probably because the design is unfinished. Also I was able to replicate the bridge overlap bug, but it only happens when I have the screen size on 2x. On 1x the issue doesn't occur. So I'll need time to figure out how to fix it. EDIT: I found a cause for some of the lag. There was a function in Essentials that was making the game run a lot worse after encryption. I updated the links above to include the version with the fix. Well I have beaten the first gym.. they guy with the level 16? rybeak is ridiculous as my team are all lvl 12-13. Nothing gives much exp either in the grass and they get stupid critical luck as well . Money is super low .. Training up is a chore.. I'm not sure if this is a Spectrum thing, or an Essentials problem, but I swapped Pokemon against the first trainer in the gym and it used Copycat. Then my opponent went before my attack and it is an infinite loop of "The foe -Pokemon- used Copycat."